Lusciously creamy goat cheese cheesecake bars with a sweet and salty, cinnamon-spiced graham cracker crust, layered with fresh figs and a drizzle of honey. See those figs? I may have sideswiped a few people during the lunch rush at our local Whole Foods to nab them. Originally, we were there picking up some apples for a slew of apple recipes I have planned over the next few weeks. On a related note, I really, really miss the apples in the Pacific Northwest. They are hard to beat. …then I spotted these beauties out of the corner of my eye from across the produce section. One, single lone basket tucked in between some blueberries and concord grapes. Because figs are in season for about twelve minutes each year, and are so, so delicate, the ones at the grocery store are usually just… sad. But these figs were vibrant and fresh and plump and decidedly not sad. This goat cheese cheesecake begins with a classic graham cracker crust, and the interesting part comes in the filling, which is super rich and familiar with a welcome added tang from creamy goat cheese. I like mine with extra vanilla and a hint of lemon, and it’s a not-too-sweet, but oh-so-rich twist on the traditional. Of course, we could stop there, and life would still be sweet. But to make things extra fancy – and delicious – we’re layering on a mosaic of fresh fig slices, and then drizzling the whole thing in honey, which ultimately seeps into the cheesecake, becoming all the more indulgent. 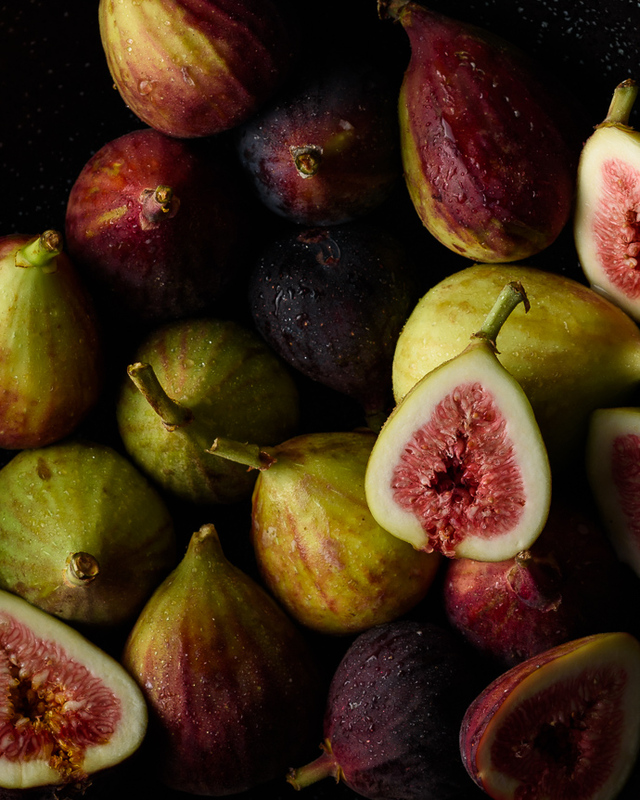 Because life is too short not to take full advantage of perfect figs. If figs are no longer in season where you live – or you have more personal shame and self-control when it comes to seasonal produce than I do – this goat cheese cheesecake is endlessly adaptable to any number of toppings. Berries of course would be delicious. Peaches and other stone fruit would be fantastic. A drizzle of caramel or chocolate? Perfect. Oh, and plain with just a simple drizzle of good honey never hurt anything. 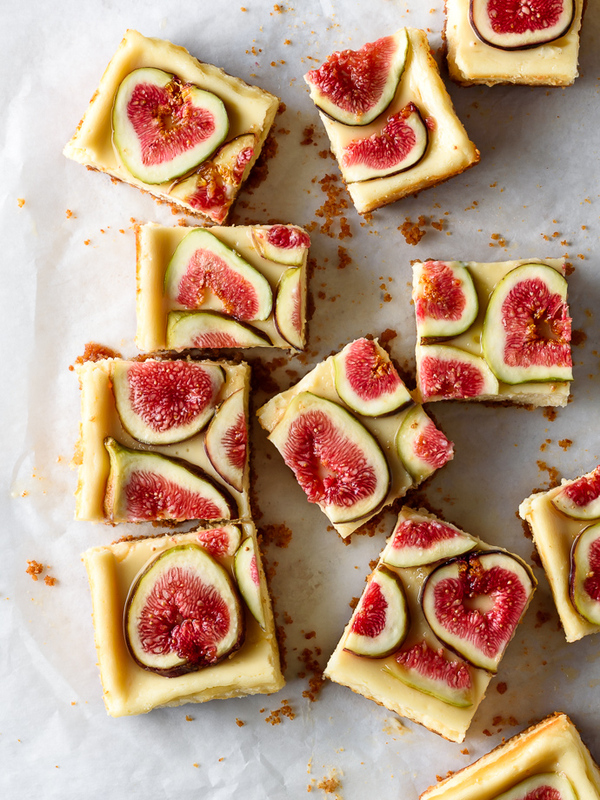 After the fact, I also thought some chopped pistachios would be pretty great with these fig and honey cheesecake bars too. Choose your own adventure! And then tell me what you make! Happy baking! Preheat the oven to 350. Line a 8×8-inch baking pan with parchment paper, leaving about an inch overhang on two sides to create a sling. Set aside. Make the crust: Use a food-processor to pulse together the graham crumbs, salt, and cinnamon. Drizzle in the melted butter and pulse a few times until combined. Spoon the crumbs into the prepared pan then press down gently into an even layer. Bake for 5 minutes. Remove from the oven and set aside. Meanwhile, make the cheesecake: Add the softened cream cheese, goat cheese, and sugar to the mixing bowl of a stand up mixer fitted with the paddle attachment. Beat together on medium speed, until light and creamy, and no lumps remain. Use a spatula to scrape down the sides of the bowl as needed. Beat in the eggs, followed by the vanilla and lemon zest, if using. Pour over the crust, and use an offset spatula to smooth the top into a smooth, even layer. Gently tap the bottom of the pan on the counter a couple of times to release any air bubbles. Bake until the sides of the cheesecake are gently puffed, and just beginning to color, 30-35 minutes. The center should still have just a tiny bit of jiggle to it, and the cheesecake will continue to cook as it cools. Remove from the oven and let cool to room-temperature, then transfer to the refrigerator and let set and chill thoroughly for 2-3 hours. 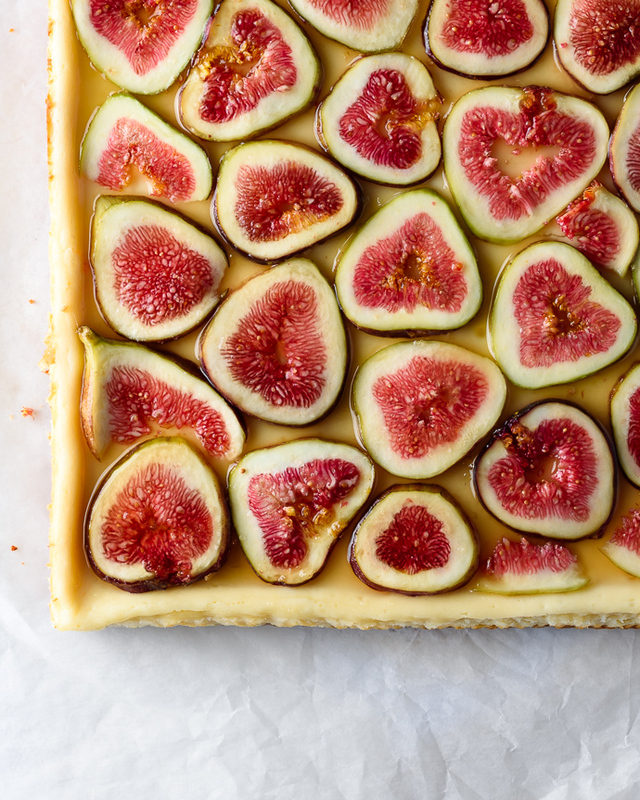 When ready to serve, slice the figs, and layer in a pattern over top the cheesecake. Drizzle or brush on honey, to taste. 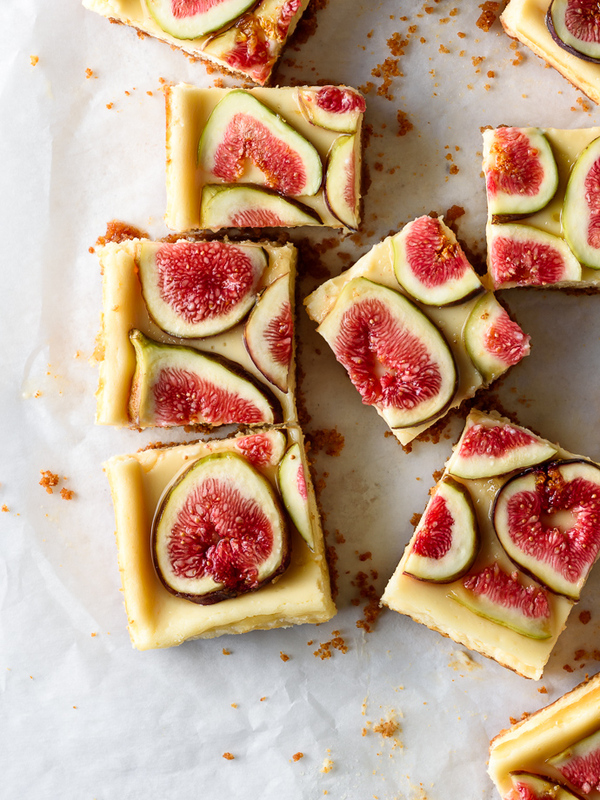 Once topped with the figs, the cheesecake bars are best served immediately. ¹ Expect to use about 11-12 traditional graham cracker sheets. ² The figs are so delicate and can get a little mushy and sad the longer they sit out, so slice them right before topping and serving. If figs aren’t in season, or tough to find, try using fresh berries, or thin peach slices, or another favorite! ³ The cheesecake itself can be made up to a day in advance. Keep refrigerated until ready to serve. 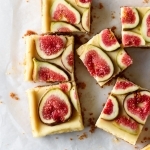 Such pretty bars, I love the fig and honey topping! Fresh figs + goat cheese + cheesecake. What’s not to love? I am soooo going to make these this weekend! Such a favorite combo 🙂 Let me know how it turns out! The cheesecake was a huge hit. Not quite as pretty as yours, but still quite delicious!